With another week of NFL action behind us, and another week of fresh data to analyze and consider, I’m here to help you with some of your toughest fantasy football start/sit decisions. Andy Dalton, QB, Cincinnati Bengals (vs. Indianapolis) – The only quarterbacks who have failed to throw for at least 300 yards against Indianapolis have been Russell Wilson and DeShone Kizer – both of whom scored at least 25 fantasy points against them nonetheless. Indianapolis ranks fourth-worst in fantasy points per game against expectation versus quarterbacks, while Dalton is averaging 19.1 fantasy points per game since Bill Lazor has taken over as the team’s offensive playcaller. Philip Rivers, QB, Los Angeles Chargers (@ New England) – The Patriots are allowing the most fantasy points per game to opposing quarterbacks (27.8), and rank third-worst in opposing passer rating (103.8). Every quarterback they’ve faced thus far has scored at least 17.0 fantasy points against them, including 20.3 from Josh McCown. Rivers, meanwhile, has thrown for multiple touchdowns or 300 yards in 19 of his last 22 games, and feels like a safe bet to finish as a QB1 this week. LeGarrette Blount, RB, Philadelphia Eagles (vs. San Francisco) – Although Blount ranks just 26th in carries per game and rarely sees involvement in the passing game, he has seen nine of Philadelphia’s 11 running back opportunities inside the 5-yard line. This is reserved for deeper leagues or teams struggling with bye weeks or injuries to their running backs, but if there’s ever a week to start Blount again, it’s this week. Over the past two seasons, opposing RB1s are averaging 22.6 fantasy points per game against San Francisco. For perspective, that’s more than names like Ezekiel Elliott, Melvin Gordon, and Leonard Fournette have averaged over this stretch. Christian McCaffrey, RB, Carolina Panthers (@ Tampa Bay) – Over the past three weeks, McCaffrey ranks eighth, fourth, and 11th among running backs in expected fantasy points. Efficiency has undoubtedly been poor, but I’m still betting on McCaffrey to turn things around. Volume should again be good against a Tampa Bay defense surrendering the seventh-most targets per game to opposing running backs and the second-most targets per game to opposing slot wide receivers (where McCaffrey runs 19.1 percent of his routes). Carolina may also place a greater emphasis on short passes as an extension of their running game, after suffering injuries to offensive linemen Ryan Kalil and Trai Turner last week. Carlos Hyde, RB, San Francisco 49ers (@ Philadelphia) – The matchup for Hyde looks tough against a Philadelphia defenses ranking second-best in both yards per carry allowed (3.06) and rushing fantasy points per game allowed (6.8) to opposing running backs. Still, Hyde ranks sixth-best among running backs in expected fantasy points per game (18.1), and should be held afloat by a high receiving-floor. The Eagles are allowing the seventh-most receiving fantasy points per game to opposing running backs (13.5), and Hyde has seen 14 targets over the past two weeks. Hyde also retains high touchdown-potential should San Francisco find themselves near the end zone, as his 10 carries inside the 5-yard line leads the league. Joe Mixon, RB, Cincinnati Bengals (vs. Indianapolis) – Mixon nonsensically saw zero second-half carries a week ago after gaining 48 yards on seven carries (6.9 yards per carry) in the first half. Still, he’s easily Cincinnati’s best running back and now has a bit of the “Squeaky Wheel Theorem” working in his favor, after complaining earlier in the week. Mixon still leads the team in carries over their past four games (57 to Jeremy Hill‘s 21) and gets set to face an Indianapolis defense allowing the most rushing fantasy points per game to opposing running backs. In their last four games, against some not-so-imposing running backs in Jacksonville (without Leonard Fournette), Tennessee, San Francisco, and Seattle, the Colts are giving up 33.6 fantasy points per game to opposing running backs. Jay Ajayi, RB, Miami Dolphins (@ Baltimore) – Heading into last week, we knew Ajayi had been an entirely different player in games when healthy as opposed to games he was dealing with an injury. He came into last week healthy, but briefly left in the first quarter with an injury, and then disappointed when on the field. Even if Ajay is banged up, this isn’t the week to sit him. Baltimore is surrendering the second-most rushing fantasy points per game to opposing running backs. Even with DT Brandon Williams back last week, Minnesota still gashed them for 160 yards and a score. Javorius Allen, RB, Baltimore Ravens (vs. Miami) – I don’t feel great about it, but you’re probably still starting Allen this week. He’s averaging 14.9 expected fantasy points per game, which ranks 10th-best at the position. The matchup isn’t great, and Alex Collins has seen a larger workload in recent weeks, but Allen saw 11 targets last week (with Collins seeing none) and Miami is giving up more fantasy points to running backs through the air than on the ground. I have him as a mid-range RB2 in PPR leagues this week. DeVante Parker, WR, Miami Dolphins (@ Baltimore) and Stefon Diggs, WR, Minnesota Vikings (@ Cleveland) – Prior to his Week 5 injury, Diggs was our highest-graded wide receiver and led the position in fantasy points per game. Prior to Parker’s Week 5 injury, he ranked eighth among wide receivers in expected fantasy points per game, 14th in actual fantasy points per game, eighth in targets per game, and second in air yards per game. If either are active this week, you’re starting them. Adam Thielen is seeing enough volume that he is a very strong play regardless of Diggs’ status. Kenny Stills, WR, Miami Dolphins (@ Baltimore) – For reasons I went into here, even if Parker plays (though undoubtedly less so), Stills is a sneaky flex play with Matt Moore starting. Landry is a high-end WR2 if Parker plays, and a strong WR1 if he’s out. Although it’s unlikely all three wide receivers return value if all are active (especially in such a tough matchup), they’re still all strong starts for various different reasons. Deonte Thompson, WR, Buffalo Bills (vs. Oakland) – Over the past three seasons, 28 percent of Tyrod Taylor‘s passing yards have come on deep targets, the highest rate in the league. Thompson was used in this capacity last week (his first game with Buffalo), gaining 107 yards and seeing three of his four targets come on deep passes. Thompson also reportedly ran a 4.31 40-yard dash at his Pro Day in 2012. This matchup is particularly appealing considering Oakland is allowing the fourth-most fantasy points per game on deep passes (13.9) and rank worst in fantasy points per target allowed (4.1) on deep passes. To make matters even better for Thompson, neither of starting cornerbacks David Amerson or Gareon Conley practiced on Wednesday. Kelvin Benjamin and Devin Funchess, WRs, Carolina Panthers (@ Tampa Bay) – Tampa Bay has been atrocious against wide receivers this year, and I don’t think anything represents it better than this chart. Both Funchess and Benjamin are easy starts this week. Nelson Agholor and Alshon Jeffery, WRs, Philadelphia Eagles (vs. San Francisco) – Undoubtedly, you’re starting Zach Ertz if you own him, but he does draw a tough matchup this week against a San Francisco defense ranking third-best over expectation against tight ends. This could open up opportunities for Agholor and Jeffery. Agholor has a strong matchup in the slot, considering San Francisco is allowing a 142.9 passer rating to quarterbacks when targeting slot wide receivers. It also doesn’t hurt that he’s 14th in fantasy points at the position. Jeffery has been less effective but has had a tough cornerback schedule to start the year and has seen a surplus of volume, ranking 18th in expected fantasy points per game (13.0). His production should start to catch up to his expectation this week, considering San Francisco is allowing the eighth-most fantasy points per game (11.0) to opposing wide receivers who line up to their quarterback’s left, which is where Jeffery runs 48 percent of his routes. Kyle Rudolph, TE, Minnesota Vikings (@ Cleveland) – Cleveland has surrendered a combined 64.0 fantasy points to such not-so-imposing names as Tyler Kroft, Jesse James, and Ben Watson. For the second consecutive season, Cleveland is allowing the second-most fantasy points per game to opposing tight ends. Rudolph also ranks second among tight ends in targets (25) the past three weeks. Though Rudolph will get a slight bump down in my rankings if Stefon Diggs is active this week, he’s still an easy must-start for me. Jason Witten, TE, Dallas Cowboys (@ Washington) – Dez Bryant has a tough matchup against a Washington Redskins defense allowing the fourth-fewest fantasy points per game to opposing wide receivers (25.5). However, Washington has been far more susceptible to tight ends, where they are allowing the third-most fantasy points per game (17.9), after allowing the fifth-most last season. Witten, meanwhile, quietly ranks fifth-best at the position in fantasy points per game (12.9). He’s another easy start this week. Jack Doyle, TE, Indianapolis Colts (@ Cincinnati) – Since Jacoby Brissett’s first start, Doyle is averaging 11.7 expected fantasy points per game, which would lead the Colts and rank fifth-most among tight ends. Over the past two seasons (preseason included), Brissett has targeted tight ends 29 percent of the time, with only Carson Wentz and Brock Osweiler ranking higher. The matchup isn’t great, but I still have Doyle as a low-end TE1 this week. Jimmy Graham, TE, Seattle Seahawks (vs. Houston) – Graham is a prime positive regression candidate, ranking second in expected fantasy points per game (12.6) but only 14th in actual fantasy points per game (9.8). Houston has seen 28 percent of their targets allowed funneled to tight ends, which ranks second-most in the league. Mostly based on volume, I have him as a top-six fantasy tight end this week. 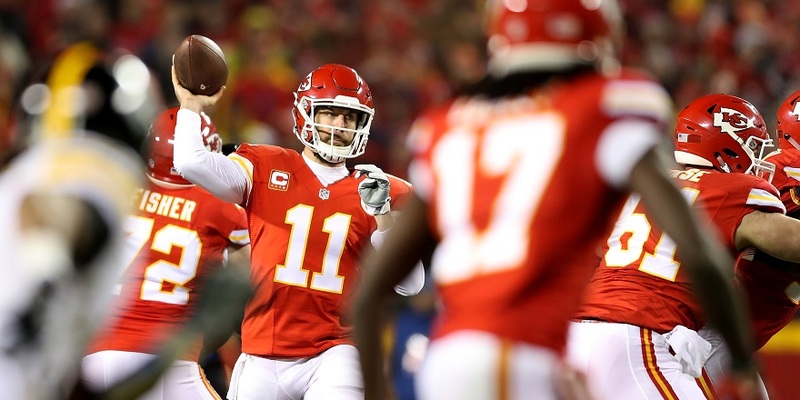 Alex Smith, QB, Kansas City Chiefs (vs. Denver) – Granted, Denver hasn’t been as tough against the pass as they were in the Wade Phillips era, nor is this the Smith of old, but the matchup is tough enough for me to move Smith just outside of the QB1 range. If you’re strong at the position, I’d consider benching him. Matthew Stafford, QB, Detroit Lions (vs. Pittsburgh) – Stafford will be without Golden Tate this week, and potentially also Kenny Golladay. He faces a Pittsburgh Steelers defense allowing the second-fewest fantasy points per game to opposing quarterbacks (13.6). I expect Detroit to go fairly run-heavy, keeping Ameer Abdullah in play as a solid flex option, considering Pittsburgh ranks fourth-best in opposing passer rating (71.3), but third-worst in yards per carry allowed (4.93). Doug Martin, RB, Tampa Bay Buccaneers (vs. Carolina) – Martin has seen a solid RB2-esque workload since returning from suspension. Across three games, Martin has totaled 47 carries and eight targets, with four opportunities inside the 10-yard line. However, he draws a tough matchup against a Carolina Panthers defense ranked fifth-best in rushing fantasy points per game (9.2) allowed to opposing running backs. I was optimistic for Jordan Howard’s prospects heading into the week with Luke Kuechly out. Before that game, since 2015, the Panthers were allowing 4.4 rushing fantasy points per game more to opposing running backs in games (nine) Kuechly has missed. Still, Howard totaled only 65 yards and zero touchdowns on 21 carries in Week 7. If Kuechly plays, Martin will fall even further down my rankings. Martavis Bryant, WR, Pittsburgh Steelers (@ Detroit) – Bryant is telling reporters he will be inactive for Sunday’s game. With that game being played at 8:30 p.m. EST, that’s enough to have me off of him. If you’re desperate and JuJu Smith-Schuster is still unlikely to play dealing with a concussion, I’d consider adding Darrius Heyward-Bey as insurance. Terrelle Pryor, WR, Washington Redskins (vs. Dallas) – Pryor played on less than half of the team’s snaps last week, totals just 37 yards in dream matchups (San Francisco and Philadelphia) over the past two weeks, and currently ranks as our sixth-worst-graded wide receiver. He’s much closer to being someone I’m dropping than starting this week. Latavius Murray, RB, Minnesota Vikings (@ Cleveland) – Over the past three weeks Jerick McKinnon and Murray have each seen 45 carries. McKinnon, at least, can still return value thanks to a greater receiving workload (15 targets to Murray’s three over this stretch). Against the team ranking first in opposing yards per carry (2.95) and fourth-best in rushing fantasy points per game allowed to opposing running backs (8.9), this is not the week to get cute. Rob Kelley, RB, Washington Redskins (vs. Dallas) – The Cowboys rank 11th-best in rushing fantasy points per game to opposing running backs (11.3) and now have star linebacker Sean Lee back in the lineup. Kelley averages 4.5 fantasy points per game and hasn’t hit even 8.0 once this season. With Chris Thompson now seeing a larger workload, Kelley will ride the bench for me this week. Marlon Mack, RB, Indianapolis Colts (@ Cincinnati) – In a 27-0 blowout loss that set up perfectly for the team’s preferred pass-catching running back (Mack), he still totaled just six targets and five carries despite out-snapping Frank Gore 32 to 22. He’s up against a Bengals defense ranking 12th-best in fantasy points allowed per game to opposing running backs (22.0). I’m benching him this week and until volume improves unless I can help it. Gore will ride the bench for me this week as well. O.J. Howard, TE, Tampa Bay Buccaneers (vs. Carolina) – Howard saw a season-high six targets last week, but his volume has been too inconsistent for me to buy into his potential as a starter just yet. Eric Ebron, TE, Detroit Lions (vs. Pittsburgh) – The Steelers rank ninth-best in fantasy points allowed to opposing tight ends (10.4), and Ebron’s recent usage has been brutal. Honestly, I might prefer to start Darren Fells over Ebron this week. I mean, don’t do that – but here’s what I mean: Over their last three games, Fells has seen nine targets to Ebron’s 10. Over this stretch, Fells has also outscored Ebron by 25.7 fantasy points.